THE PEOPLE – All Marine Solutions is the leading complete service provider in premium marine maintenance, installation and repair in South East Queensland. Its team of experienced technicians and craftsmen is highly proud of its workmanship, and operates with integrity to ensure jobs are done to the highest standard with emphasis on detail. THE CUSTOMER EXPERIENCE – Earning a reputation within the marine industry for its diverse skill sets, All Marine Solutions has an on-site servicing capability, coupled with a large network of national and international suppliers. Whether a particular project is large or small, All Marine Solutions offers complete and premium solutions under the one roof. This service excellence provides convenience and peace of mind to customers. 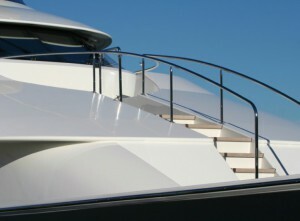 Inspection and consultation – All Marine Solutions deploys its engineers to inspect and consult directly with clients. The scope of the works, large or small, is thoroughly discussed with the client to ensure the client can draw from the experience of the engineers, and the engineers ensure that the client’s requirement is understood. Benefit – A peace of mind where the scope of work is clear. Maintenance agreement – All Marine Solutions manages preventive maintenance services of equipment in various recreational and commercial vessels. This ensures that these vessels are able to function effectively and are free from downtime. Benefit – Little or no down time experience due to unplanned equipment failure. Procurement and engineering – All Marine Solutions has a large network of national and international marine products suppliers. This means that quality products are accessible at a timely and economical manner. Furthermore, its network within the marine trade services ensures that specialised engineering work can be professionally coordinated. Benefit – Optimum solution with quality product and workmanship. Maintenance, installation and repair – Whether a job is about maintaining, installing or repairing an equipment at a Marina or at a residential home, All Marine Solutions is able to travel to site with fully equipped work vehicles. Benefit – Convenience to a client’s busy schedule. Testing and commissioning – As All Marine Solutions is a turnkey service provider, its technicians execute all scope of work from start to finish. All works are tested and commissioned before declaring that the job is completed. Benefit – Assurance that equipment is fully tested by professional staff.